In a franchise you, as a franchisor, are expected to oversee and maintain some of the aspects for your business to run smoothly. It makes sense: you need to keep on with the times and update your franchise so it’s not left behind. And this also needs to be done with your SEO strategy. As you may know, SEO is pretty important to get that online presence you need but it needs maintenance with time. SEO, which stands Search Engine Optimization, are a set of techniques (like content marketing, keywords, etc.) that help your site and your business gain visibility online. This way, when somebody searches for a term related to your franchise on Google, you show up in the search pages. It’s safe to say that, unless you’re in the top spaces in a search, people will not notice you and they’ll probably go to your competitors! Actually, according to MarketShareHitsLink.com (October, 2010), 75% of users don’t even scroll past the first result page! That’s a lot of clients that are now resorting to your competitors. And since SEO is a moving target, optimizing your sites just one time won’t work! You need to manage and maintain your franchisee sites! Still, even that ain’t as easy as it sounds: your franchise’s SEO needs to be localized too. You won’t get away with just a generic update! If you want to do it right and get all the perks SEO brings, you need to make it fit to the local audiences’ needs. Before you start modifying your franchisee sites’ SEO, you need to have goals. Having a clear intention with your sites and with SEO is crucial to finding out whether you’re fulfilling the site’s purpose or not. If you need a bit more help in this department, click on the link to learn how to set goals for your franchise SEO strategy! You may be familiar with the marketing term: benchmarking. This basically means that you set specific goals and after a determined period of time, you look at where you are and if your goals where met. This can help you know how your SEO strategy is working for you and what you could change to improve it. If you’d like to take it one step forward, you can benchmark to measure your site’s productivity. Titles are very important! These are the ones that appear in the search results after a visitor’s made a search query in the browser. So, basically, it’s through them that your visitors get a sense of what a specific page in your site’s about and if it fits with what they’re looking for. On the other hand, they’re also useful because they help out the search engines classify the pages in your site. 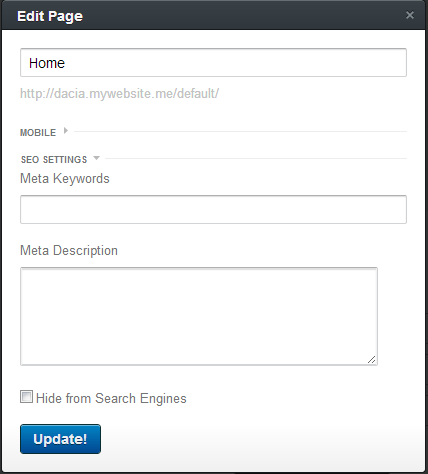 This way, it will know if your page is relevant to what the user is searching for. Remember to use the keywords you want to show up for in the search pages in your title! It’s important to localize the titles as to not confuse your readers and the search engine! The meta description is the side dish for the title tag: it’s a brief text that describes a certain page in the results from a search query. It’s a way for visitors to know a bit more about your site and your business. It gives a bit more information on that particular page which can further convince users to click into your site! Keyword placement and content development are the pillars that make your SEO strategy make sense. It’s through content that you get to the top spots in the search pages. By updating your site’s content with localized information, you are giving your readers and the search engines a validation to your business and a reason to comeback. If you need some ideas on how to localize content and avoid a duplication penalty, click on the link! As you may know, Empowerkit is a CMS that allows you to control your franchisee sites. Through it you can also take a hold of your franchise’s SEO efforts. The editor allows you to intuitively (no coding necessary!) go through and manage various SEO aspects. This is pretty straightforward: when clicking into the panel like the one above (by clicking the Page button in the bottom shelf), the first field, titled “Home” in the image, is where you can add, edit and put keywords into your page title! Quick and easy! In that same panel, you’ll have the option to, in the “Meta Description” field, to add that extra sentence that will explain a bit more about your page and lure the visitors into your site! Just click the “Update!” button when you’re finished! Empowerkit is a Content Management System that allows you to double click and add, edit or remove blocks of text. This way you’ll have full control over the content and keywords in your site! Your SEO strategy needs to be on point. Furthermore, you need to be mindful of why you’re doing it so you know if it’s working and if it’s not, so you can change your strategy. Remember that you need to watch out and localize your strategy so your franchisee sites can be in tune with their local audiences! Have a question or comment? Let us know in the section below!